As a newbie blogger I have been muddling along trying to write a mixture of interesting posts never sure if I was connecting with anyone so imagine my surprise when today I discovered I had been nominated for the Very Inspiring Blogger Award! What a huge compliment! I was nominated by my most favourite blogger Rose at http://howdoyousaytacoinspanish.wordpress.com. Rose has been helping me learn Spanish by posting wonderfully funny Tecate Beer commercials and she even offered an entire tutorial on how to cuss in Spanish which I have already found numerous occasions to put into practice. You really must check out her blog about her time spent in Mexico. 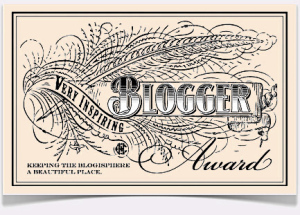 The Very Inspiring Blogger Award is a way of creating community amongst bloggers. 2. Announce your win with a post and link to whoever presented you with the award. So here are 7 interesting things about me. I live in Winnipeg, Manitoba, Canada which is one of the most beautiful but also one of the coldest cities on earth. I will officially retire May 31, 2013 after 30 years in health care. I am so proud to be able to say I have helped save lives! My husband and I bought a house in Progreso, Mexico this winter and will be heading down there for our first extended visit in September. I love to knit and crochet. I am a proud mother/stepmother of six children, proud grandma of eight grandchildren (with one more on the way) and one cat. I Hereby award the Very Inspiring Blogger Award to the following blogs which engage my interest in expat living, travel, all things Mexico, and people who are living the simple life. Cheers to them and I would highly recommend them all to you. So take a look at these blogs. They are a real mix of practical advice, whimsy, and just people living authentic lives. Back soon with an update on the work in progress on the Progreso house. Things are changing! Kudos on your recognition, and much thanks for including The Artist’s Road on your list of chosen blogs! As a writer, I find the name “Progreso” as the home of the next chapter of your life filled with so much promise! I’m honored and grateful! Thank you … and also thank you for making me aware of these other blogs. I obviously need to update my feed reader. Good luck this September! Hoe to meet you soon. Hi Writing from Merida. It was such a pleasure to start reading your blog. Books, bees, writers, flowers…..What’s not to love? I must thank Lee for sending you my way. Currently my blog is really just a bit of fluff to keep our family and friends informed on the renovations to Casa Lulu and to let them know a bit about the area. In the future I hope it will be a promotional tool for the rental accommodations we will have. But I have been enjoying the writing exercise so who knows how it may evolve. I hope we can stay in touch and perhaps meet in real life in the not too distant future. We plan to head to Progreso for our first extended visit around the first week of September.